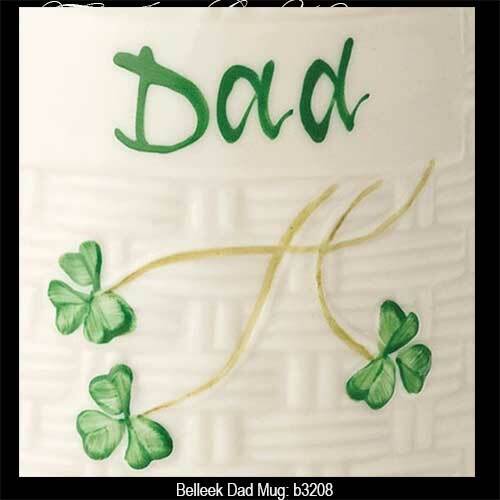 Belleek dad mug pays tribute to Irish fathers with its hand painted design that includes shamrocks. This Belleek mug is enhanced with an embossed basket weave motif. 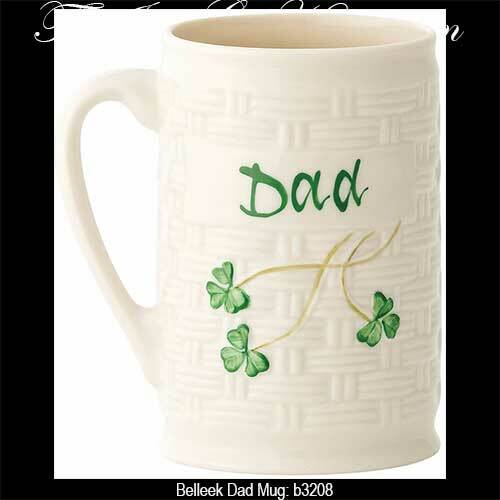 The Belleek dad mug features hand painted green shamrocks and text. The Irish father's mug is made of fine china and measures 4" wide x 4 1/2" tall. The Belleek China mug holds 12 ounces and is safe to use in the dishwasher along with the microwave oven. This Irish dinnerware is hand crafted in Belleek, Ireland and is gift boxed with a shamrock history card, complements of The Irish Gift House. The Belleek mum mug features the colloquial Irish version for mom and it includes green shamrocks. Belleek mug with shamrocks is for herself, the queen of the home. This Belleek mug with shamrocks is for himself, the king of the castle.